Stay at a PV Holiday Village and save up to 40% off the accommodation price. Self-catering family apartments are available from 580 euros per week. English speaking kids clubs, aqua fun, sports and activities all on site. 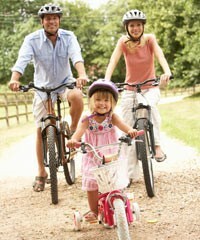 Pierre & Vacances offer child friendly holidays, spa breaks, active breaks and cultural breaks. Book by 9 July 2012 – wide range of dates available. Special offers – Pick up a bargain holiday in France and Spain. Grassy meadows, sparkling lakes, wild flowers and snow-capped mountain peaks, children can play safely outdoors discovering the natural beauty of the mountains in summer. Younger kids can feed farm animals and paddle in lakes. Older ones can go white-water rafting or mountain biking on traffic-free cycle tracks. For littlies, Kinderhotels baby-friendly hotels provide bibs and high chairs to buggies. Kinderhotel alpine family holidays offer up to 60 hours a week of free childcare – from nurseries for babies as young as one week old, up to activities for adventurous teenagers. Choose any of 33 Kinderhotels in beautiful Alpine countryside and take advantage of: a wide range of activity programme for children – free baby and toddler equipment – fully trained English-speaking nannies – all meals included – fantastic value for money with 1 week for 2 adults & 2 kids all inclusive for as low as £1,500. Great value Family Adventure Holidays at YHA Okehampton, 2 nights full board and activities for £115 per adult and £92 for under 14s. Package includes 3 half day activity sessions from programme and 1 evening activity. 3 night and 4 night packages available plus extra nights can be added. Activities suitable for children aged 5 and over. Listed by Sunday Times as one of Britain’s best value activity holidays for 2010, YHA Okehampton have tried to ensure that Family Adventure camps are equally keenly priced for 2012, with good activities and good food. Prices for Family Adventure Breaks. Mark Warner, the family holiday specialists are offering up to 45% of summer holidays – holiday in June from £470. Visit one of their resorts in Greece, Turkey, Sardinia, Corsica or Portugal for this offer. And get this, for 2 – 17 year olds kids clubs are included in the price; childcare is provided from 4 months. Teenagers can enjoy the Indy Club full of activities and the obligatory chill out time. Mark Warner aim to get children as young as 3 out the water in a Fun Boat and throughout the week their kids clubs offer children the opportunity to sail, windsurf, kayak, play tennis and mountain bike. Specials Offers – Mark Warner. Selectcamp are offering summer half term camping holidays from £100 for the family at selected campsites across France, Spain and the Netherlands. Arrival dates 2 June 2012 and 9 June 2012.Check individual campsites for offer prices. Campsites are in beautiful locations with plenty of recreational activities. Selectcamp.co.uk – Last Minute Half Term Deals from only £100. Vacansoleil is offering cycling packages at 7 of its campsites across Europe. Packages can be booked by quoting code NFA with the offer varying depending on the campsite. Campsite De Twee Bruggen in the Netherlands and Campsite Ferienpark Arber in Bavaria are both perfect for family cycling. At the latter, 7 days bike rental with one cycle tour with tour guide is just 58 euros per person per week. Check website for last minute and summer half term deals. Esprit is offering some incredible money-saving deals for early bookers and their list of offers is really impressive. For example, free holidays for infants, free drinks for all the family, free ice-lollies for children, free packed lunches, free children’s evening entertainment whilst parents dine…For alpine adventure and family adrenaline activities take a look at what’s on offer. Summer family holiday offers from Alpine Adventures. Valid on all European parc holidays of 5-21 nights; holidays up to 28 June 2012; all accommodation and on top of Keycamp’s other great offers. Keycamp family camping holidays in Europe – Special Offers. Landal GreenParks | Over 65 bungalow parks in the Netherlands, Belgium, Germany, Austria, Switzerland and the Czech Republic. Acorn Family Holidays offer exclusive single parent holidays to Normandy, the Ardeche and Wales at affordable prices. Departs July and August with adult prices from £469, and from £419 for children for activity camping holidays. All the hassle of entertaining is taken away with a huge choice of activities and opportunities to make friends. Self drive and coach available. Acorn Family Holidays – Exclusive Single Parent Holidays.